Alastair Donald, Mindy Gofton, Martin Bryant and Lisa Raynes introduced a discussion on the lure of the social city and what role it can play in regenerating city space. New technologies are also often credited too with reviving sociability and civic engagement. Social media banish loneliness while digital platforms help create ‘networked publics’ organised around collective goals or issues, the transparency of the data-commons helping reform civic society. Some might question whether such innovations are genuinely able to transform relations between city institutions and the public, turning them from exercises in concealment and spin to thriving interactions based on accountability, dialogue and participation. Others insist, however, that this is not merely top-down or bottom-up, but rather a new, more democratic form of peer to peer interaction. So where do we stand on the claims for the City 2.0? Digital technologies certainly offer new opportunities to interact, but to what extent is this fostering a revival of sociability and engagement? Might the quest for evermore data and transparency be more enslaving than enlightening, and do social media twitch-hunts and twitterstorms suggest that ‘open source’ cities are perhaps not so open after all? Cities have often been celebrated for their anonymity and the ability to bring together strangers. Do social media merely relocate these opportunities to cyberspace - or is crowdsourcing a less than adequate replacement for crowds? For all the claims that an online culture can help promote new forms of civic engagement with the city and the formation of new collectives, is there still something missing from the City 2.0? The Manchester Craft & Design Centre are hosting this discussion as co-organiser to proudly mark their 30th birthday! From it's humble beginnings in 1982 to becoming an award-winning centre for craft retail and development, the centre has been an iconic part of life in Manchester's Norther Quarter. 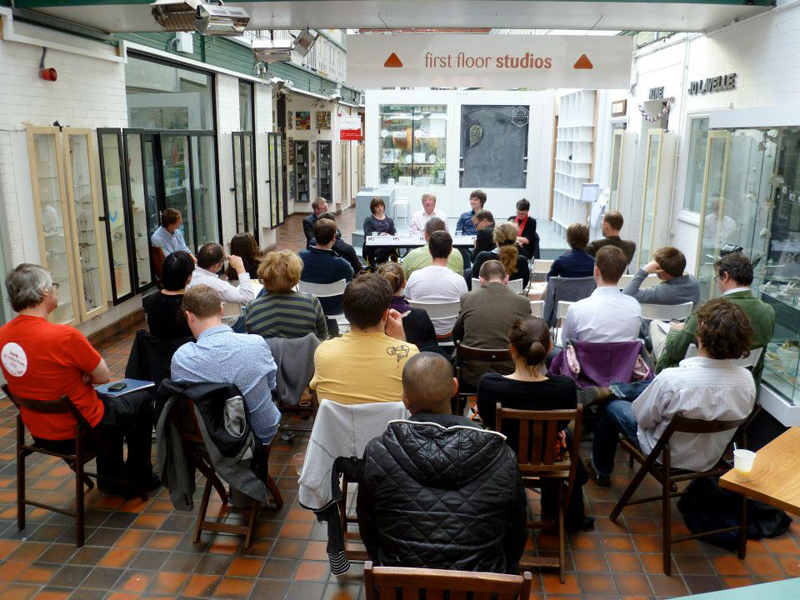 The Manchester Salon are delighted to be invited to coordinate this discussion, also part of RIBA's Love Architecture Festival 2012 by way of understanding how we can shape the future of Manchester's Northern Quarter in the next 30 years. The delightful and quirky confines of the Manchester Craft & Design Centre will provide a poignant backdrop for this discussion on how the area's own future can be sculputered from the resources available in abundance in the area. For more on the 30th anniversary events at the MCDC, click here and please sign up to their mailing list for reminders of events, workshops and exhibitions. Click on this Love Architecture link for more information about the full panoply of events in that Festival. Blackwell's has an enviable reputation as a bookseller specialising in academic books, and stock a wide range of university textbooks, specialist books and books for the general reader. Blackwell University Bookshop have for a number of years hosted many Machester Salon discussions in their bookshop, and are now, helpfully supporting this discussion by providing some copies of Lure of the City for sale on the night, edited and contributed to by Alastair Donald.